Port McNeill Part of the BC Adventure Network. Over a million web site visitors annually ! Offering warm hospitality to visitors, Port McNeill is the gateway to northern Vancouver Island. As well as being so close to the amenities and activities of the north island, there are many recreation opportunities for the visitor right in the Port McNeill area. Area streams are great for trout and winter steelhead sportfishing, while endless coastal waters are famous for salmon fishing. Local forest companies give free forest tours to let the visitor see what is happening in the forest. BC Ferries offers visitors a chance to take a day trip to Alert Bay and Sointula to enjoy the sights of these two communities. Other visitors may wish to explore the forested mountains or endless lakes and streams by hiking or biking. 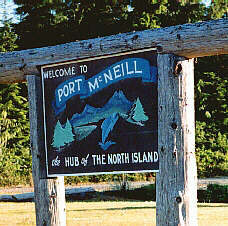 Access: Port McNeill is 200 km (124 mi.) north of Campbell River, off Vancouver Island Highway 19 or 50 km (31 mi.) south of Port Hardy. BC Ferries has a sailing to Alert Bay (8 km) and Sointula. Local airlines also serve the area. Recreation Facilities & Activies: golf course, tennis courts, fishing, boating, camping, whale watching, and nature trails. Local Attractions: Demonstration Forests, Forest tours, Little Hustan Caves, World's Largest Burl (22.5 tons), and the North Island Forestry Centre.